Tioman is an island befitting the stars. Whether you seek relaxation or adrenaline, we've got you covered. With miles of secluded palm-fringed beaches, clear turquoise waters, abundant marine life, misty mountains and lush greenery, savour each moment as you indulge in one of the world's most beautiful islands where 'Bali Hai' was filmed in the Hollywood classic 'South Pacific', in addition to the recent Hong Kong TV Series 'The Ultimate Goal'. 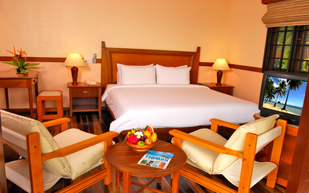 Each chalet is air-conditioned and fully equipped with modern amenities for a stay of comfort in tropical paradise. Featuring adequate room space to enjoy a relaxing moment, the chalets are air-conditioned and fully equipped with modern amenities. The Deluxe Chalets offer even bigger spaces to accommodate family and friends. 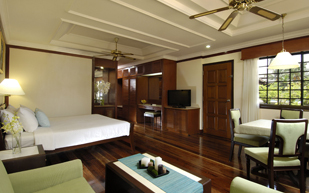 Each chalet is air-conditioned and fully equipped with modern amenities. Fully equipped with upgraded amenities with generous space to accommodate a family. Using this website and the Service means you accept the terms and conditions. We may at any time modify our terms and conditions. Sailing, time, itineraries, accommodation or packages made are subject to change for reasons of weather conditions, tide, operational requirements and availabilities etc. We will not be liable for any consequential losses, injuries or death and additional costs incurred regardless of reasons. Tickets & room purchase are non-refundable and non-exchangeable except in the case of cancellation by service operators and suppliers. We are neither responsible nor liable for Overbooking, misinformation or mishandling of any reservation or booking by the suppliers. Any other dissatisfaction or complaint or relating to the quality of the products or services provided by the supplier. An online booking requires payment in full or a deposit at the time of making the booking. Prices featured on the web may differ if you proceed to book over the phone. Any refunds will not cover foreign exchange rate differences, bank charges and the handling charge incurred. The suppliers listed on web reserve the right to make changes to their pricing without prior notice. We may charge administrative or handling fees for making payment by credit/debit cards. Fees would be advised & shown before payment made if applicable. Copyright � 2008-2013 Island Connection Travel & Tours Sdn. Bhd. All Rights Reserved.